In 2008, Thomas Schreiner published New Testament Theology, a comprehensive analysis of the theological message of the New Testament. For this volume, Schreiner has pared down that larger work in an attempt to make his central message more palatable to a broad audience. Though both are aimed at pastors and students, this volume is designed to appeal to those wanting to work through a book with a less daunting page count. For this abbreviated edition, Schreiner explains that he has “eliminated virtually all footnotes” and points readers to his “larger work for more in-depth discussion” (9). Consequently, for many potential readers, this volume will relegate Schreiner’s New Testament Theology to the reference shelf. 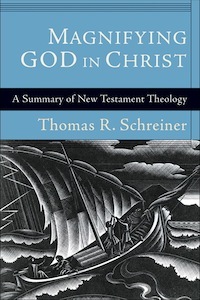 In comparing the two works, Schreiner has essentially reversed the order of his title and subtitle, highlighting more directly his thesis about the theology of the New Testament. Schreiner parses “magnifying God in Christ” by stating that “NT theology is God-focused, Christ-centered, and Spirit-saturated” (19). 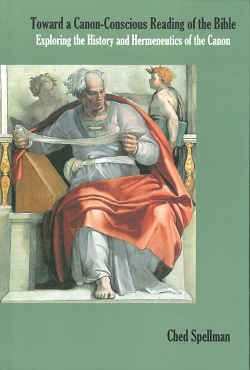 His work seeks to expose “the centrality of God in Christ in the concrete and specific witness of the NT as it unfolds God’s saving work in history” (19). In other words, Schreiner argues that the thrust of the New Testament demonstrates that “God will receive all the glory for his work in Christ by the Spirit as he works out his purpose in redemptive history” (19). His goal is to demonstrate this reality inductively at the level of the individual books as well as on the level of the whole of the New Testament. Those who own Schreiner’s previous volume will not need to obtain this one, as it is functionally an abridgement of that work. However, Schreiner does add a brief “pastoral reflection” to the end of each chapter where he very quickly points to possible areas of application. For instance, in the reflection after the first chapter, Schreiner asks, “Does the already-not yet emphasis of the NT make any difference in Christian life and ministry?” (36). He argues that this framework can guard against “political utopian schemes” and the illusion that perfection can be achieved this side of Christ’s return. This reality can remind believers that they are not yet free from the effects of sin, encourage spouses to treat one another with grace, keep parents from demanding perfection from their children, and protect individuals from debilitating guilt about how imperfectly they strive for holiness. This type of reflection is helpful, though some of the other sections are not quite as developed (e.g., 57, 77). Schreiner has refashioned a valuable and edifying resource that will be especially useful to those who share his evangelical convictions regarding Scripture. As stated above, Schreiner’s intended audience is “pastors and students” (9). Evangelical pastors will appreciate his interaction with critical issues and his able defense of many conservative positions. His central thesis is also encouraging for those in the church looking for an energetic articulation of what the New Testament is really all about. Students who have read other New Testament theologies will benefit from exposure to a thematic and inductive approach with a sustained thesis throughout. The size of this version might also better suit the book to New Testament courses at the undergraduate level or in a church setting. As an entry point into Schreiner’s theological reflections on New Testament theology, this streamlined version will be a welcome contribution for those looking for a manageable treatment of the subject.